The following is a guest review. The review and photos do not necessarily reflect the opinions of Michael Crawford, Captain Toy, or Michael's Review of the Week, and are the opinions and work of the guest author. 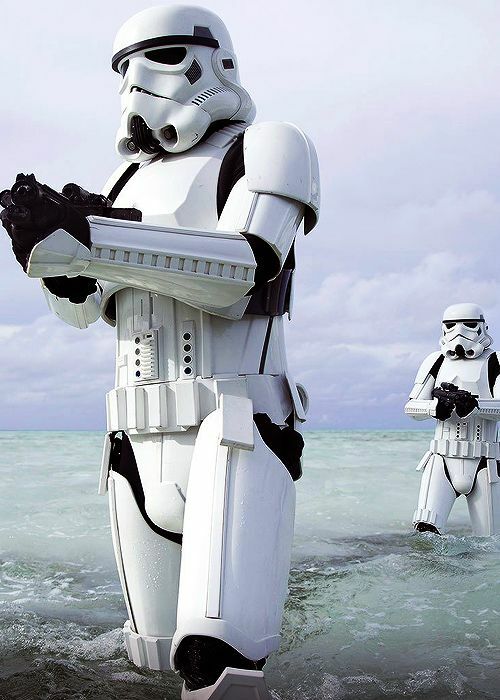 Imperial Stormtroopers. These are supposed to be the dreaded and brutal crack troops of the evil Galactic Empire (as designated in the original Star Wars film). 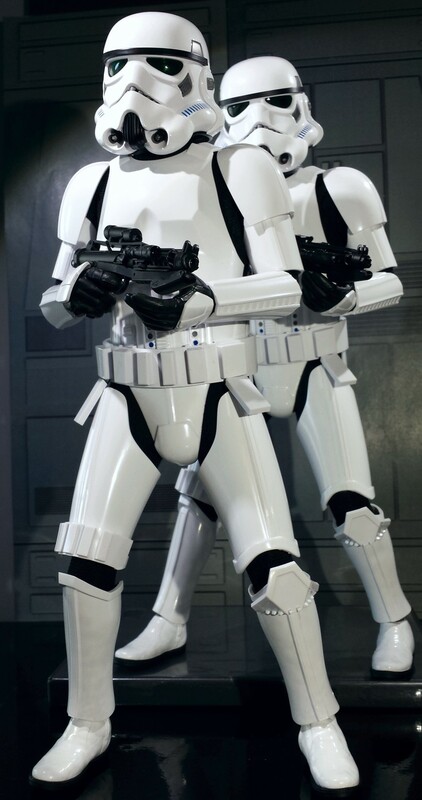 They are clad in iconic and possibly ironic virgin-white armor that does not seem to keep any blaster bolt or even the occasional arrow from harming them (yes, I know it is supposed to make them reminiscent of skeletons and help keep them alive in space). Their heads are encased in helmets that mask their human appearance, helping us feel little or no empathy for their fate, and apparently preventing them from seeing well (is that why they are so brave, yet so inept?). They are taunted for being weak-minded and for being supposedly precise shots, while consistently failing to kill any named protagonist (they wounded one, once… probably because her male co-conspirator moved out of the way). They are blamed for other people’s faults and yet carry on with their thankless work. They set their weapons for stun and generally seek to politely arrest the very same fanatical terrorists who are slaughtering them by the AT-AT-load and stop at nothing to blow up the only thing that could secure peace and prosperity in the galaxy (admittedly through fear) … twice (or is it thrice now?). Hmmm. I submit to you that if not unsung heroes, these poor doofuses might well be considered the pitiable victims of their dogmatic creator (George Lucas), their senile or esoteric, uncaring and self-centered bosses (Emperor, Vader), their own sense of duty and obedience, and the sanguine disregard for human life or civilized behavior on the part of said radical terrorists and even easily-manipulatable man-eating teddy-bears. Given the consistency with which Stormtroopers are abused in the Star Wars saga, shouldn’t we consider them victims, underdogs, and sympathize with them? And now we know that they are not robots or clones but the unwitting conscripts forced into service by a totalitarian government by being snatched away from their families like some futuristic proto-janissaries (and even if they were clones, don’t clone lives matter too?). Perhaps I have been taught to question too much, perhaps it is too difficult to resist the Marxist notion that only some groups are worth vindicating, or perhaps films designed for children and young adults do not really stand up to any serious in-depth analysis. If only one of the new spin-off films would adopt a different perspective… Speaking of films, I have digressed too far. Hot Toys recently produced a new 1/6 scale Stormtrooper action figure as part of its Movie Masterpiece series (MMS 393). Although the official name of this product does not reference it except on the instruction sheet, this figure is specifically an Imperial Stormtrooper as they appear in Rogue One. 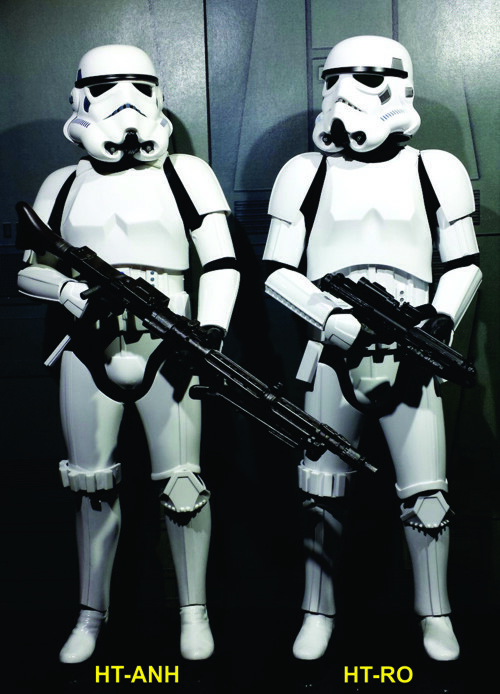 The classic Stormtroopers featured in each of the Original Trilogy films, their appearance changing ever so subtly from film to film (for better effect or actor experience, not to convey a change in the uniform). 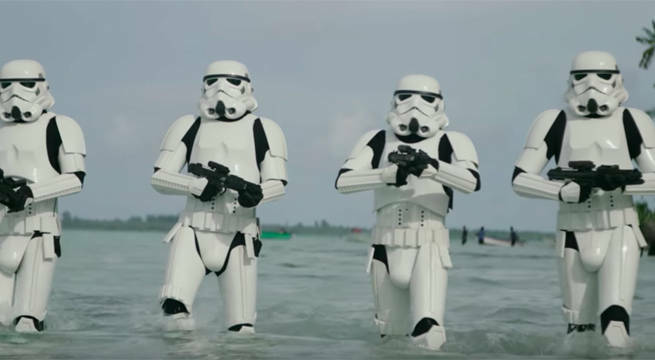 So it should be no surprise that the Stormtroopers in Rogue One also have a slightly different appearance, even if the action takes place mere days before the beginning of the original film, A New Hope. 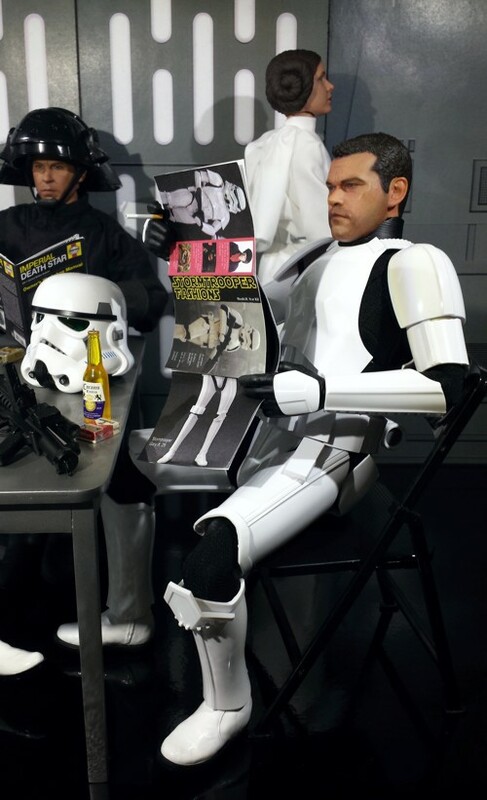 Consequently, Hot Toys, which had already released an excellent Stormtrooper action figure from A New Hope (MMS 267), had the occasion to capture the trooper’s slightly different appearance in a new film and also the opportunity to improve upon its earlier product. Now don’t get me wrong: I enjoyed Rogue One very much and I think it is perhaps the best Star Wars film produced since Return of the Jedi (or possibly even since Empire Strikes Back, considering Jedi’s questionable second half). But I got this action figure because it is essentially a classic Stormtrooper from the Original Trilogy, not because it was a new, slightly different Stormtrooper from a new film. 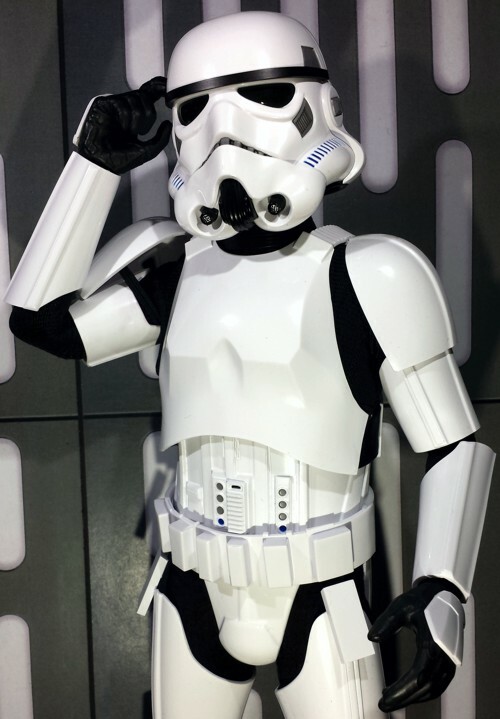 You might ask yourself whether one really needs another Stormtrooper? That, of course, is up to each individual collector to answer, but in my opinion the rhetorical question should really be whether one could ever have enough of them (admittedly, cost and space might get in the way of building an army). Besides, in terms of appearance, the new Hot Toys Stormtrooper represents a palpable improvement on their earlier product. As an Original Trilogy purist, I have relatively little interest in the new troopers (Death Trooper, Tank Driver, Shore Trooper, and that unfortunately revised Imperial Ground Crew), in part because they remind me too much of things we have seen in the Prequel and Sequel Trilogies, however well-made they might be. But another classic Stormtrooper? How could I resist! In this review I will evaluate the new Stormtrooper action figure not only in itself and in relation to Rogue One, but also in relation to Stormtroopers in the Original Trilogy, and the earlier Hot Toys Stormtrooper action figure based on A New Hope. Thus, in some respects, this is a comparison review. 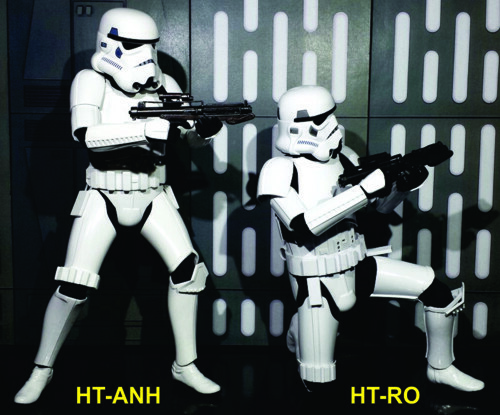 In cases where both Hot Toys Stormtrooper action figures appear in a picture (like the comparison pictures), they are labeled accordingly. 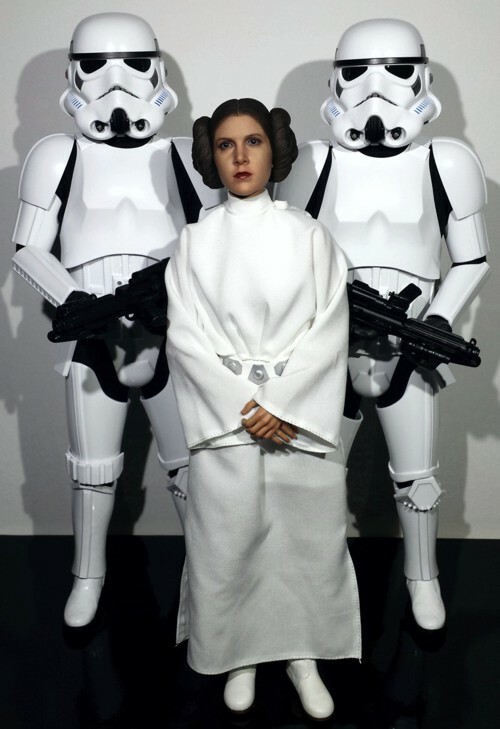 Readers might find Michael Crawford’s detailed reviews of several earlier action figures helpful for comparison: Hot Toys Jedha Patrol Stormtrooper, Hot Toys Luke Skywalker in Stormtrooper Disguise, Hot Toys Stormtrooper, and also the Sideshow Imperial Stormtrooper. 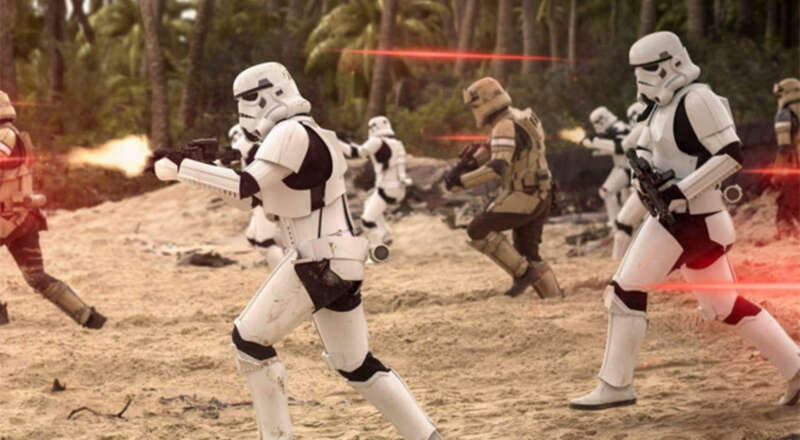 Some useful reference images from Rogue One or its promotions can be found here and here and here and here and here and here and here and here. 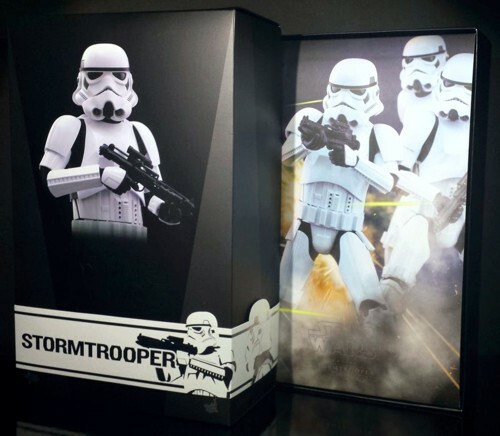 Hot Toys’ new Stormtrooper comes in the now familiar two-shades-of-black shoebox-style cardboard container, with a superimposed white band containing the product’s name and a couple of Stormtrooper graphics running near the bottom of the cover. Above this is a photo of the Stormtrooper’s upper part, and the Star Wars logo. The back of the box features the typical information, alongside something I had not seen before, a shiny little Disney certificate of authenticity sticker. 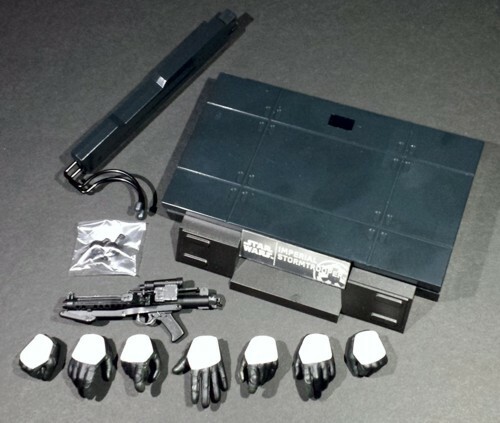 The box includes a folded instruction sheet, which explains that the Stormtrooper’s armor is not removable, and how to work the gun and action figure stand. Inside the box is a single plastic tray with a clear plastic cover, on top of which is a colorful cover card featuring three Stormtrooper action figures engaged in a laser firefight. Everything inside is collector friendly and the packaging fulfills its primary purpose of keeping things safe. Overall, it is perfectly adequate and well-made, without being a stunning work of art. Overall, the sculpt of the helmet and the armor is as sharp and accurate as one could possibly expect. The helmet, as always in the case of Stormtroopers, is the most difficult piece to get right, and the present version appears more accurate than those produced previously by Hot Toys and Sideshow. In particular, the slope over the nose and mouth is steeper, and the bottom of the helmet’s face (over the mouth and chin) does not stretch as far forward and downward as in the earlier sculpts. There is more space between the “eyes” and the “frown” than between the “frown” and the “mouth.” In all this the new helmet corresponds much more closely to the helmets used in both Rogue One and in the Original Trilogy than the earlier products. Moreover, there is even greater attention to detail: the lines atop the side-tubes on both sides of the lower face, or within the indented areas on the cheeks and on the back of the head, are now not only painted, but also slightly indented. In this respect they perhaps improve upon the actual helmets used in the film, where these detailed were painted. While the helmet appears to be spot-on for Rogue One, it is ever so slightly off in comparison to those used in the Original Trilogy. This is because the Original Trilogy helmets were based on molds taken from a hand-sculpted and unintentionally asymmetric sculpt, which has contributed to their somewhat variable and difficult to replicate precisely appearance. This asymmetry or “wonkiness” has been fetishized to no end, and defended on the basis of the asymmetry of the human face (which hardly requires an asymmetrical helmet) or actual helmet production (which seems unlikely for any technologically hyper-advanced society producing armor in mass quantities). Overall, while the symmetrical new helmet does exhibit a slight and difficult to pinpoint difference from what we saw in the Original Trilogy, it nevertheless corresponds perfectly to what we saw in Rogue One, and to what, arguably, the Original Trilogy would have featured given more modern technology. Whatever version of helmet one might prefer, Hot Toys did its job in replicating the helmet’s appearance from this particular film perfectly; and while it gives me some pause in reference to the Original Trilogy, it is nevertheless an improvement on the earlier products in this scale. It might also be pointed out that the Rogue One helmet seems to combine the distinctive features of the “hero” and “stunt” helmets used in A New Hope. Like the “hero” helmet, it features a low “brow” reaching almost as far down as the top of the “eyes,” while the “eyes” themselves have bubbled goggles; however, like the “stunt” helmet, this helmet has four indents on each side of the “frown.” The “eyes” of the helmet are wider and less elongated than those in the earlier Hot Toys and Sideshow releases, and their lenses are more curved, which makes them more movie-accurate once again. 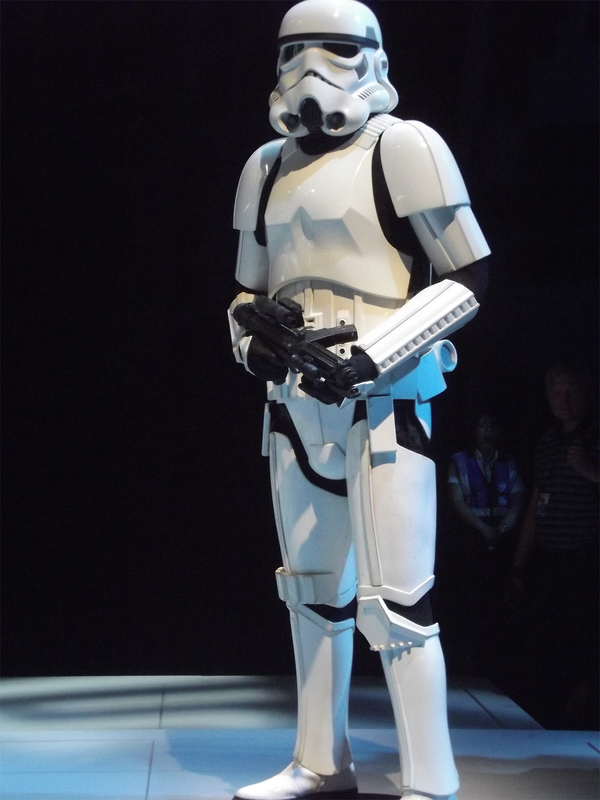 The Stormtrooper armor corresponds to what we see onscreen in Rogue One, and this includes various minor but palpable changes from the Original Trilogy design. As before, I suspect most of the changes were intended as functional improvements rather than a deliberate change in the uniform, something that would have been a questionable decision for a film intended to precede A New Hope by a matter of days. Because of these differences, pretty much every single piece of the new action figure’s armor is sculpted a little differently from the earlier Hot Toys Stormtrooper. 1. The diagonal gap between the armor’s chest- and back-plates under each armpit. 2. 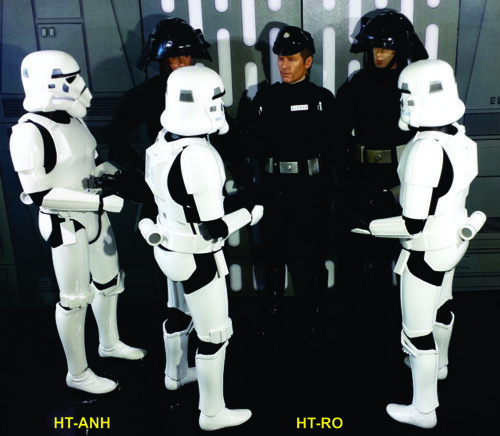 The greater gap between the bottom of the chest-plate and the top of the button-covered controls on the abdomen-plate (this actually seems to vary depending on each individual Stormtrooper’s height: the gap lessens with shorter Stormtrooper). 3. One of the round buttons on the abdomen plate from the Original Trilogy has been replaced by a narrow sunken rectangle; also, the buttons are now sunk rather than protruding. 4. The details on the belt are also a little different, with the Rogue One belt featuring non-identical boxes or protrusions. 5. 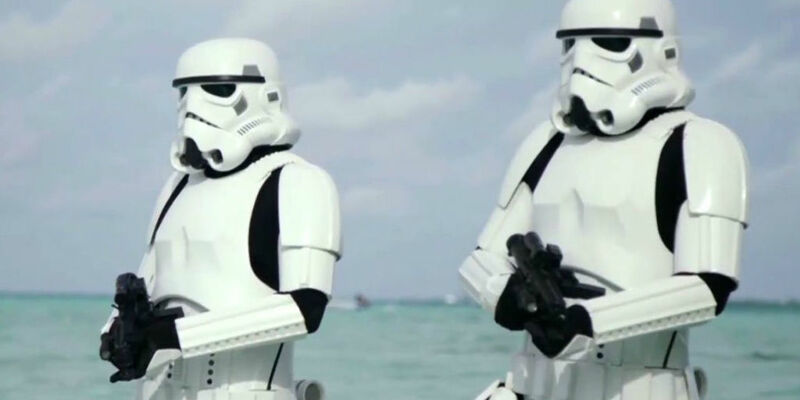 In several places, the Rogue One armor is cut back further than in the Original Trilogy, to allow greater freedom of movement. This is the case with the chest- and upper-plate, and also the upper- and lower-leg armor. The resulting greater gaps between the pieces of armor are especially evident on the backside. 6. The attachment of the shoulder straps connecting the chest- and back-plates is much more pronounced on the back than it was in the Original Trilogy. 7. The back-plate has an indented section along the top of its “backpack” portion, and also a little hole on the upper right. 8. The boots are different from those used in the Original Trilogy, missing the characteristic U-shaped indent on the side. All of the above are specific to Rogue One Stormtroopers and are correctly reflected in the new action figure. If we can judge from set photos, the chest armor’s neckline is perhaps not cut quite as deeply as on the film props, but this is probably not readily apparent with the helmet on. The cylindrical thermal detonator worn on the back of the belt is now permanently attached. Apart from the painting of the thermal detonator (discussed below) and some minor details on it, this is a functional, rather than visual difference. 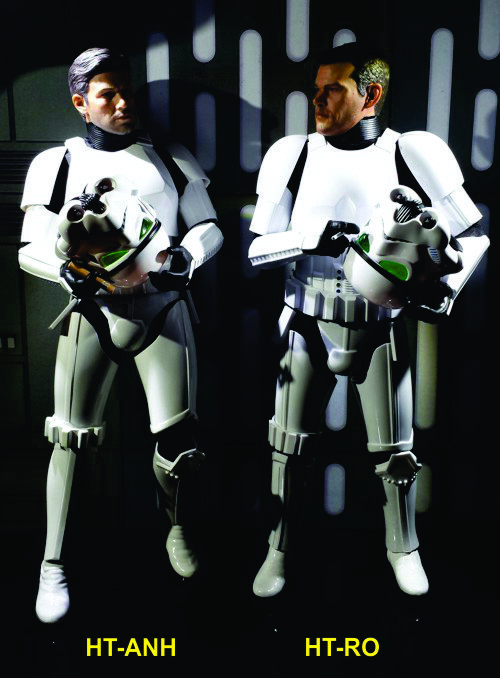 While a limitation (Stormtroopers were sometimes missing the thermal detonator, like the uniform of TK-421 usurped by Luke in A New Hope), it is also an added convenience, as the removable thermal detonator in earlier action figures has the annoying tendency to fall off extremely easily during posing. 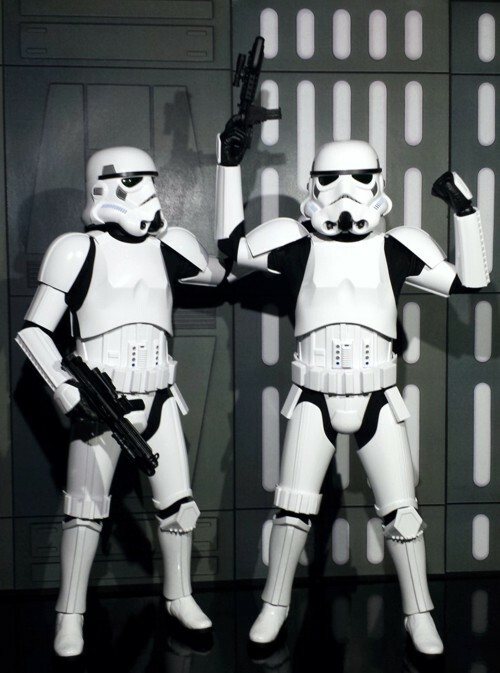 Differences between different Stormtrooper appearances in film apart, the new figure once again exhibits greater attention to detail. Thus, the “seams” on the upper- and lower-arm and upper- and lower-leg armor now have a doubled edge that we have not seen in the earlier Hot Toys and Sideshow releases. This is not something specific to Rogue One, but was already the case in the Original Trilogy. Something along those lines might be the case with the tiny hook-shaped indentations on the upper edge of the upper-arm armor (where it tucks under the shoulder armor). The Stormtrooper action figure stands about 11.75 inches tall, and thus slightly taller than the recent Hot Toys farm boy Luke (which was a little under 11.5 inches tall). The underlying Hot Toys body has excellent articulation, including an ab-crunch, double-jointed elbows and knees, and just about everything else you might want, short of the super-flexible Phicen products. Although the cloth black under suit does not restrict the body very much, the armor does. This is in large part due to the low-riding belt, which is attached to the lower part of the abdomen armor and prevents the upper legs from being raised much. 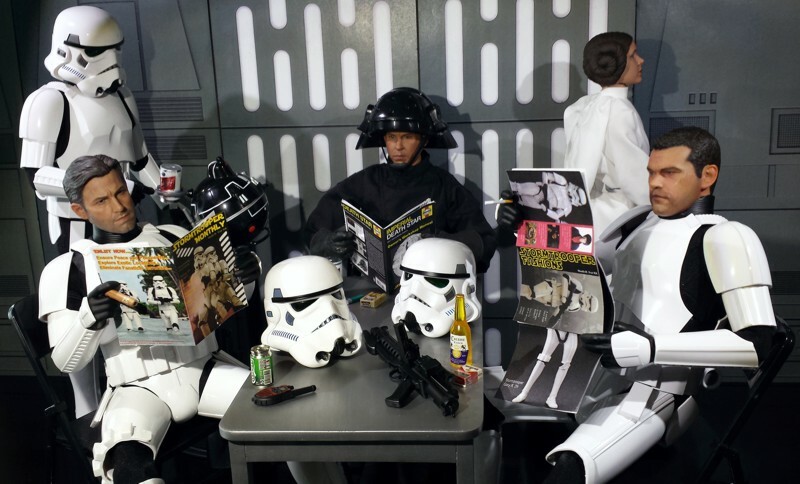 (Fittingly, the extras playing Stormtroopers in A New Hope were also restricted by their armor and unable to sit down.) The armor is not supposed to be removable (as pointed out in the instruction sheet), but if you are as stubborn as I am, you would want to use your action figure to its full potential, especially because of (or despite) the price point. I heated the belt and abdomen armor with a blow dryer and gently pried them apart from below with the blunt bottle opener of my Swiss Army Knife. As far as I can tell, no damage was sustained by any part of the armor or outfit. If you want to do this, proceed carefully and at your own risk! Now the belt can be pushed up over the abdominal armor, allowing the legs to be raised far enough to sit, more or less. Elsewhere, especially if you shift away the neighboring portions of the arm and leg armor, you can achieve pretty good articulation with the elbow and knee joints. It is difficult to raise the figure’s arms up due to the shoulder armor, despite it being attached to elastic straps. There is also virtually no possibility for crunching the abs to any really noticeable degree. On the other hand, the ankle articulation is very good, and the neck can be posed surprisingly well. Without my modification to the belt, I would have subtracted half a star from the rating for this category, but now I am pretty happy with the articulation and it seems to me that the new Hot Toys Stormtrooper is actually a little more poseable than its predecessor. This is the one really disappointing thing about the product itself. I consider the attached thermal detonator part of the uniform and although it is a welcome addition, the action figure base hardly qualifies as an accessory (it seems to constitute part of the Death Star’s floor). Similarly, the added pair of wrist pegs is really spare parts rather than accessories. This leaves us with five additional hands (making altogether seven hands that include two gun-grip hands, two fist hands, two relaxed hands, and one open left hand) and the only true accessory, a blaster rifle. Although based on the classic imperial blaster rifle, this one (which is movie-accurate for Rogue One) features slight differences in some of the details and seems to have been redesigned. The most obvious difference from the classic piece is the added flashlight (?) on the right side of the blaster rifle. As in earlier releases, it has a fold up stock and is slightly weathered. I know that the average Stormtrooper (as opposed to Sandtroopers or Luke in Stormtrooper disguise) do not carry a whole lot of things with them, but that is rather disappointing, particularly at this price point. 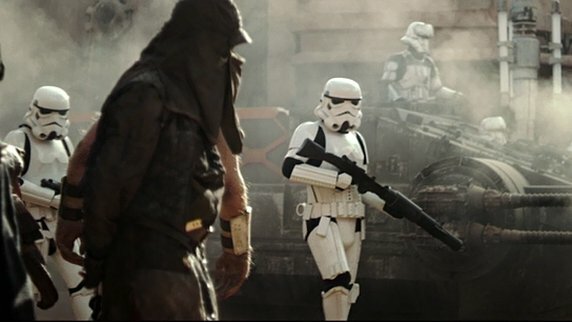 The long blaster rifle from A New Hope or from Rogue One’s Jedha Patrol might have been a sensible and very welcome addition to the present product. Although there is no actual light feature with this product, I will mention again the helmet's film-accurate green lenses. Although they appear black (or blackish) to the naked eye in most circumstances, if you shine a light from below at the neck or take off the helmet, you will see that the lenses are both green and transparent. This was already the case with Hot Toys' earlier Stormtrooper action figure, but the quality of the lenses and their coloring seems to be better in the new product. Everything here is executed perfectly. Apart from the armor, which is excellent and was already discussed under Sculpting above, there is little else. The belt and thermal detonator were also mentioned under Sculpting. The black cloth under suit looks great, bridging the gaps between the different pieces of armor, looking slightly ribbed (in addition to the ribbed collar on the neck). The under suit is a little more restrictive than that which came with Hot Toys’ previous Stormtrooper, but it still allows for good articulation, armor allowing. Unlike the previous Hot Toys Stormtrooper, this one does not come with a gun holster, which makes sense given the absence of these holsters onscreen in Rogue One (in fact, holsters are also not present in at least some scenes from the Original Trilogy). This is too sophisticated and expensive to be a child’s toy, but it actually seems quite sturdy. Adult collectors should be able to pose the Stormtrooper safely and effectively in various active or inactive poses, especially if they modify the belt like I did (but proceed at your own risk!). The Stormtrooper stands quite well even without the included stand. At the pre-order stage, this figure was available for about $180-190, not including shipping. It sold out like hot bread, perhaps because this was actually what passes for a fairly decent price for a Hot Toys movie-based action figure these days. You can still look for it on eBay, where it currently retails for about $230-260 (with free shipping at the higher price range). That seems rather much, and all the more so if you want to get more than one (Stormtroopers, right?). On the other hand, apart from the somewhat limited articulation and single true accessory, this is an excellent figure and, contrary to what one might initially suppose, there is very little re-use due to the many little differences from the earlier Hot Toys Stormtrooper (although some of the other new Rogue One figures produced by Hot Toys like the Jedha Patrol Stormtrooper might be re-using some of what went into this figure). Not much. As always, be careful swapping hands, although Hot Toys has provided a couple of extra wrist pegs. Shift the armor around if you are trying to achieve a deeper action pose with a knee or an elbow. And unless you are very brave and very careful, don’t try to pry anything off the figure, as it might get damaged. In the present product Hot Toys has produced an excellent 1/6-scale replica of the Imperial Stormtrooper as he appeared in Rogue One. I don’t think we could have expected a more exact rendition. As an added bonus to those of us who are most at home with the Original Trilogy, this Stormtrooper works great alongside the earlier Hot Toys Stormtrooper action figures based on A New Hope, despite the slight differences. And I suppose you could always swap helmets between them. After my modification to the belt, I became a lot happier with the articulation than before. While disappointing, the scarcity of accessories is not altogether unreasonable or unexpected. That leaves the price the only thing I really don’t like about this action figure, but it was my own fault for not jumping on the more reasonable pre-order while I had the chance. Of course, if you are reading this review before making your mind whether to get one of these in the first place, you are in the same boat as me. But if you don’t have any or enough classic Stormtroopers, these are arguably the best produced in this scale so far. - has a variety of Hot Toys Stormtroopers, including the Rogue One for $190. - had the Rogue one version for just $180, but has sold out. They have other options however, and you should keep an eye on them for future releases as well. 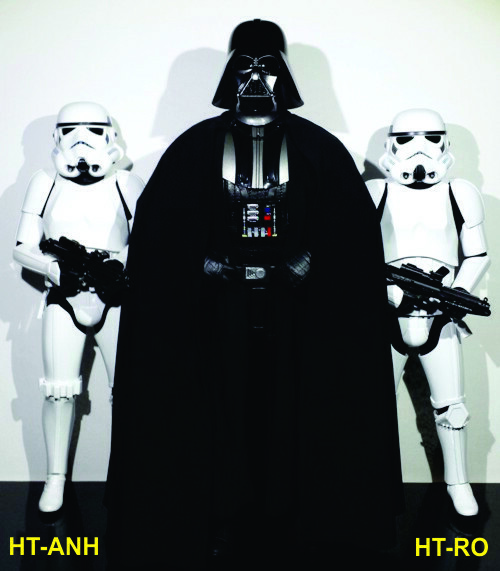 Over the last several years, Michael has done a number of detailed reviews on several 1/6-scale Stormtrooper action figures (most of them already mentioned above), including Hot Toys Jedha Patrol Stormtrooper, Hot Toys Luke Skywalker in Stormtrooper Disguise, Hot Toys Stormtrooper from A New Hope, and also the Sideshow Imperial Stormtrooper. This product was purchased for the review by the reviewer. Photos and text by Ian Stefan.